Ryanair, Europe’s No.1 airline, today (2 Apr) launched its Summer 2019 inflight range which will feature brands such as Clinique, Sosu and Tan luxe. 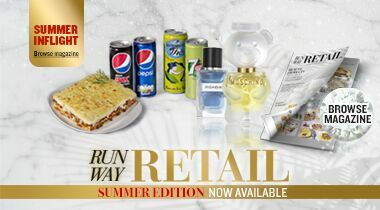 Ryanair’s Runway Retail Boutique will offer a further 20% off on core fragrances, ensuring 75% cheaper prices than the high-street on Europe’s favourite branded products. Ryanair has also added a range of skincare products and customers can now benefit from discounts on brands such as Kiehls, Clinique, Elizabeth Arden and Alpha H. Cosmetic holiday essentials including exciting must haves such as Tan Luxe self tanning drops, Sosu vacation lashes and Lipstick queen by Frog Price will also be available onboard. Ryanair’s new and improved Getaway Café Menu also has new great additions for summer 2019 such as The Barilla Bolognese. Passengers can now have a meal deal for under 500cals with new ‘free from’ options this summer, including lactose free chocolate, sugar free soft drinks, alcohol free beer, or vegan options which will also be available with new-ins such as the meat free vegan lasagne or a wide range of vegan drinks and snacks that have the “PETA – approved vegan” logo. Ryanair has also been successful in reducing its range of products containing palm oil from 33% to 19% for April 1st 2019 and expects to reduce this further by another 4% by winter 2019. To celebrate Ryanair is announcing plenty of onboard competitions for passengers to get involved in, where they can win flight vouchers, holiday vouchers, trips to music festivals and more. Customers can find further details within the Ryanair Inflight magazine and follow #ryanairinflight for inspiration.